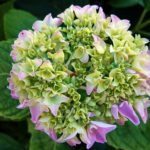 My hydrangea has black spots all over the leaves. What is this, or is it normal? It has fungal leaf spot. Control options include cleaning up and disposing of any fallen leaves or removing those still on hte shrub to prevent spreading. Avoid overhead irrigation, which wets the leaves, and use drip irrigation, soaker hoses or a watering wand instead. 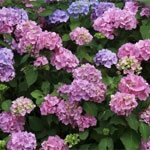 It is helpful if your oakleaf hydrangea is planted in an area where there is good air circulation. Make sure it is not crowded by other plants. This permits the leaves to dry quickly after rain, which helps prevent leaf spot diseases. You can also apply a fungicide.